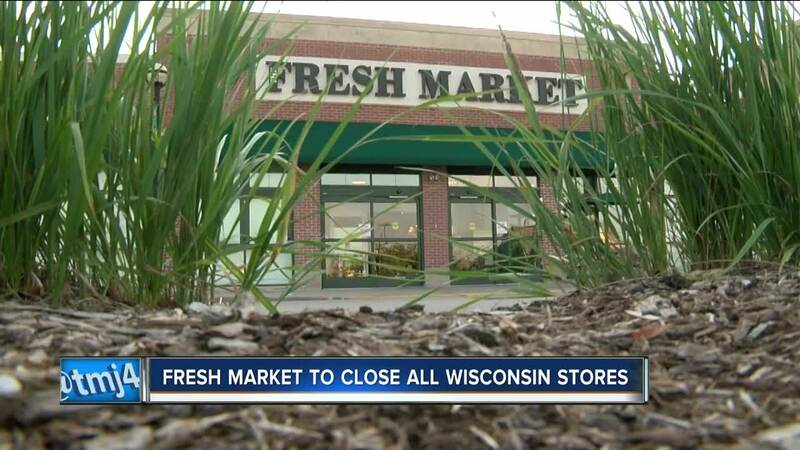 The Fresh Market grocery store announced it will be closing two Wisconsin locations in Fox Point and Brookfield. The store said in a news release Monday that it will close 15 stores nationwide based on overall growth strategy and long-term financial performance. A sign on the store in Fox Point said the store closed early on Monday for a "store meeting." Many customers stopped by unaware of the closings and were disappointed to learn the news. "I try to eat everything fresh and for that, I like going to fresh market," said Rory Kurtz, who says this is his family's primary grocery store. "We were both thrilled to find such a nice little grocer in the neighborhood so yeah that’s a little bit of a heartbreak to find out they’re closing." The Fox Point and Brookfield locations are among 15 within the company considered "underperforming." "It always seemed like they had good products but they were a little expensive so we didn’t shop here all that often," said Bill Bristow, Fox Point. Competition from other grocery chains likely contributed to the decision. According to our partners at the Milwaukee Business Journal , experts have said the Milwaukee area is "over stored" when it comes to grocery chains. "It's sad that they can’t make it," said Bristow. The store says it does not anticipate any more closures in the foreseeable future. There was no specified date for when the stores will close. The two locations are the only ones in Wisconsin.